A light appetizer to serve for a dinner party. It can be made ahead and refrigerated until ready to serve. You will probably need to ask your grocer’s fish department to skin and slice the salmon. Make sure you tell them that you are making Carpaccio, so they know to slice it thinly. Do not get smoked salmon, because it will have an entirely different flavor. Lemon Infused Extra Virgin Olive Oil is being used and can be purchased on-line at Spicewood Food Company. Thoroughly rinse each individual piece of salmon under cold water and set on paper towels to drain and pat dry when adding to plate. Take 2 tablespoons of the lemon infused oil and drizzle over a serving plate. Then place each piece of salmon onto extra virgin olive oil. 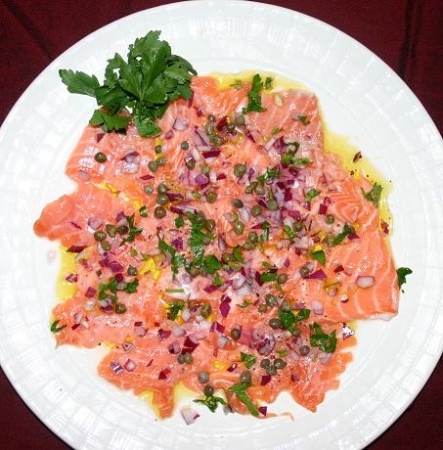 Once all salmon is arranged onto serving platter drizzle with remaining extra virgin olive oil. If drizzling from bottle, go slowly and try to make sure each piece of salmon has some of the goodness! Squeeze lemon over salmon. Again, try to make sure each piece gets the lemony flavor. Sprinkle red onion and capers over plate. Sprinkle a very little bit of kosher salt and freshly cracked pepper. Refrigerate for at least an hour and serve family style. Garnish with chopped Italian parsley if using. Try Pomelo Sauvignon Blanc (California),Layers Adelaide White Table Wine by Peter Lehmann Wines (Australia), Villa Maria Unoaked Chardonnay Private Bin (New Zealand), Saint Arnold Texas Wheat with a lemon wedge (Houston, TX), or Paulaner Hefe-Weizen (Germany) or try a Limoncello Martini.